You know improving what you eat can affect your long-term health and well-being—but you might not realize that even small changes can make a big difference. If you haven’t already discovered these four powerhouse foods, adding them to your weekly shopping list can give you a health-promoting diet upgrade. According to a growing number of physicians, scientists and natural-food advocates, milk taken from cows that have not been injected with the synthetic hormone recombinant bovine growth hormone (rBGH) is a healthier option. What’s more, mounting evidence shows that full-fat dairy products are healthier than skim and low-fat versions. A meta-analysis of 16 studies found that full-fat dairy was either inversely correlated with obesity and metabolic disease, or not associated with them at all. In other words, people who ate the most high-fat dairy foods had the lowest risk for obesity, diabetes and cardiovascular disease. Coconut OilCoconut oil is a rich source of medium-chain triglycerides (MCTs), which are easily used as energy but are difficult for the body to store as fat. 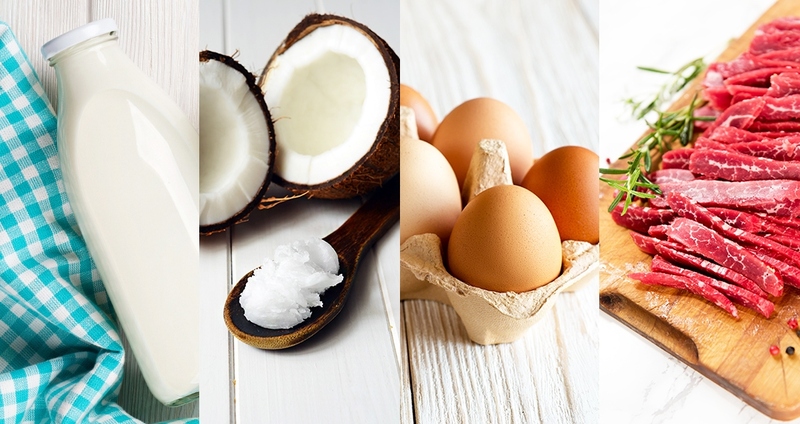 Several clinical studies have demonstrated that MCTs, and coconut oil specifically, can lower lipid levels, aid in fat loss, stabilize blood sugar and increase metabolism. With its subtle flavor and long shelf life, coconut oil is an excellent all-purpose cooking and baking oil. And considering its smoke point is higher than olive oil, it is an even better option for sautéing or roasting. Use coconut oil in place of butter, margarine, olive oil, or any other type of oil in all types of recipes. Choose fresh, organic and unrefined coconut oil, because it contains the most nutrients and no chemicals. Eggs are one of the most nutrient-dense foods available. They’re a great source of antioxidants, iodine and vitamins A, D, E and the Bs. But not all eggs are equally healthy. Studies show that commercially raised eggs are up to 19 times higher in pro-inflammatory omega-6 fatty acids than pasture-raised varieties. So, look for eggs that don’t just say organic but also come from pasture-raised hens. Red meat is finally shedding its reputation as a health villain—recent scientific evidence has shown suggested links to heart disease and cancer are ill-founded. While red meat in general is a healthy choice, grass-fed varieties do have greater benefits. Grass-fed beef, bison and lamb has two to four times more omega-3 fatty acids. Meat from grass-fed cows contains three to five times more conjugated linoleic acid or CLA, an essential fatty acid that helps increase metabolic rate, boost the immune system and keep cholesterol levels in check. Grass-fed meat also has more vitamin E, beta-carotene and vitamin C than grain-fed meat.